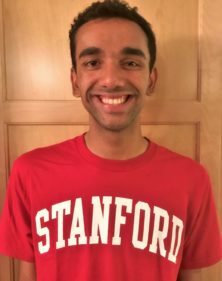 SAN GABRIEL, CA – Gabrielino High School senior Sanjaye Narayan has been named a 2017 National Merit Scholarship Recipient, a prestigious distinction granted to just 7,500 of 1.6 million students who apply by taking the PSAT. The National Merit Scholarship Corp., established in 1955, identifies talented American youths and encourages them to develop their skills. Students apply and are admitted through a combination of PSAT scores, academic record and extracurricular achievements. The pool of 1.6 million students is narrowed to 50,000 students across the U.S. who receive top PSAT scores. That pool is further thinned to 15,000 semifinalists and, eventually, the 7,500 finalists. Recipients receive one of three scholarships: A $2,500 National Merit Scholarship Corp. scholarship, a corporate-sponsored scholarship or a college-sponsored scholarship. Narayan received the National Merit Scholarship Corp. award totaling $2,500. The scholarship is the latest of Narayan’s achievements during four years of intense academic dedication. He earned a perfect SAT score – a feat no other Gabrielino student has accomplished before – and competed in two state championships and one national tournament during four years on Gabrielino’s speech and debate team. Narayan also earned a spot on the 2017 National Speech and Debate Academic All American Team, an honor reserved for students who have attained at least a 3.7 GPA, an SAT score of 2100 and who have earned superior distinction (750 points) at speech competitions. Narayan will continue his education at Stanford University, where he plans to study a combination of computer science, business and economics – interests inspired by his father and his brother, who is pursuing a computer science degree at UCLA. Narayan will graduate with nearly 440 of his peers at Gabrielino’s commencement ceremony at 6 p.m. Wednesday, May 31 at the Santa Anita Park and Racetrack. 052417_SANGAB_SCHOLAR: Gabrielino High School senior Sanjaye Narayan has been named a 2017 National Merit Scholarship Recipient, a prestigious distinction granted to just 7,500 of 1.6 million students who apply by taking the PSAT. Narayan will graduate on Wednesday, May 31 and continue his education at Stanford University. Gabrielino High School senior Sanjaye Narayan has been named a 2017 National Merit Scholarship Recipient, a prestigious distinction granted to just 7,500 of 1.6 million students who apply by taking the PSAT. Narayan will graduate on Wednesday, May 31 and continue his education at Stanford University.